In this delightful collection of 52 devotions, Evelyn Bence reflects on gatherings at her table that have brought together friends, family, and neighbors. The anecdotal meditations ease the door ajar, gently inviting you to welcome others to your table. You see her planning a gathering, choosing recipes, thinking about how to make guests feel at ease. For seasoned hosts, Bence provides encouragement and camaraderie. For novices, she offers gentle instruction laced with humor, realistic expectations, and recipes to try. Many readers will remember Evelyn Bence as a frequent contributor to Daily Guideposts. Known for her warm, personal writing, she offers devotional gems and recipes in Room at My Table that will appeal to a wide range of Christian women. The book makes a thoughtful hostess gift. Come along, Bence gracefully urges — you, too, can make room at your table for others to share a meal or even just a cup of coffee and dessert. 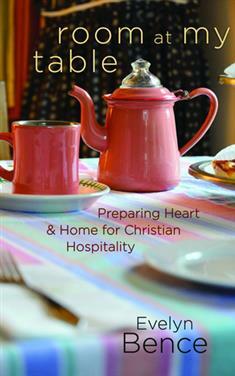 Whether your table is humble or grand, you can reach out to others and enjoy offering hospitality.